LONDON (Reuters) - Hedgehogs have finally humbled burger giant McDonald's after years of campaigning, forcing the company to redesign its killer McFlurry ice-cream containers. McDonald's said in a statement the design change had resulted from pressure from the society which prompted "significant research and design testing" to develop new packaging. "The smaller aperture of the lid has been designed to prevent hedgehogs from entering the McFlurry container in the unfortunate incidence that a lid is littered and is then accessible to wildlife," it added. 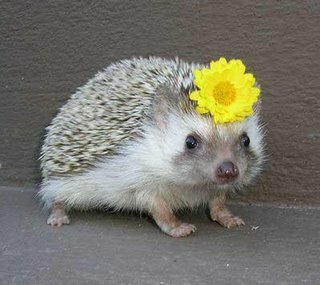 *i keep wondering about the "untold numbers" of hedgehogs who have been savagely killed by mcflurry containers. is it like the woman who spilled hot coffee over herself at the drive-thru, leaving a legacy of cardboard coffee sleeves in the wake of her lawsuit? while i don't begrudge the hedgehogs their victory, i wonder if this is a case of corporate social responsibility run amok??? I'm glad. It was hard to drive home with that cup on my hand. CSR run amok or not, that is a damn cute hedgehog!